These comprise Manual Call Points where recommended and raise the Alarm throughout the building, usually found on escape routes staircases etc. There is no Automatic Fire Detection built in and is operated by someone raising the alarm. These are concerned primarily with preserving life, and enabling all occupants other than those immediately affected by the fire, to make good their escape from the building. There are several categories within the L system identified as L1 through to L5(lesser). The sub categories denote the type of Automatic sensors, sirens and beacons to be fitted and where. These denote an Automatic Fire Detection System installed to take on the additional task on not only preserving life but protecting the building and contents as well when the building is quite and unoccupied. The system should automatically dial out to the Brigade as a matter of course. Again there are various sub categories from P1 to P5, where the type of protection from the sensors used may be varied. Fire Systems maybe configured by mixing and matching categories to produce an alarm fit for purpose in any particular premises. Also bear in mind that the construction of the building should be such that fire resistant materials are to be used which can slow down the spread of a major fire and its gases, thus giving people the time they need to escape once the alarm is raised. The object of the Automatic Fire Detection system is to raise the alarm at the earliest possible moment to allow an escape. 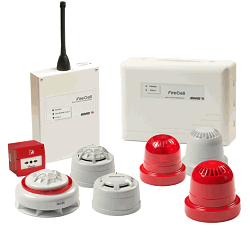 ITS Fire recommend the use of BT GSM Redcare to transmit your AFD signal to the Alarm Receiving Centre. TIME TO RING US FOR HELP! 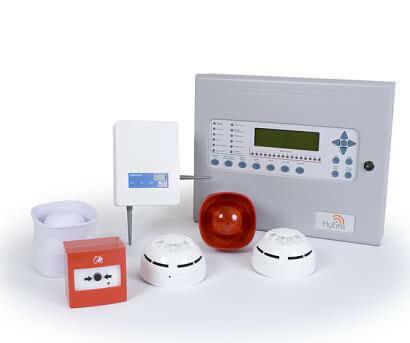 There are several advantages to installing wireless fire alarm systems – the main one being that because there are no wires – the installation is less disruptive to your existing decor. Radio Fire Alarms are similar to Wireless Fire Alarms but can operate over much larger distances. The are ideal for linking different buildings on a site.